Ok, so I broke down about a year ago and got my kids a trampoline after months of begging and pleading and promising that they would never get bored with playing on it. Everything went well for the first few months: the kids would spend hours outside, without even having to be told to get out of the house, and it seemed like they really would never get tired of their new toy. All that changed after about six months though. Even I was impressed that the excitement lasted as long as it did, but my trampoline went untouched by my children for over a month when I finally asked why they don't play on it anymore. Their answer? "It's boring." Alright, I shouldn't be surprised by this. Kids have a short attention span and they're in constant need of new experiences to stimulate their little minds. But I was determined to not let the money I put into that trampoline go to waste, so I've tried out several trampoline toys over the last few months. Here are the ones my kids seem to enjoy the most. This is super cool and a lot of fun just to watch the kids enjoy. It doesn't really add much to the jumping experience itself, but it does make climbing onto and dismounting the trampoline fun in its own way. I can't tell you how many times my adventurous older daughter has begged me to go rock climbing (I mean, really? She's four!) Now she can do it from the safety of the backyard, while my youngest absolutely cannot get enough of the slide. Who says trampolines have to be all about jumping? This is one especially popular when the kids have friends over or we're throwing a party. My oldest and her buddies are all super competitive and I've seen them literally spend hours trying to beat each other's "high scores" at this game. 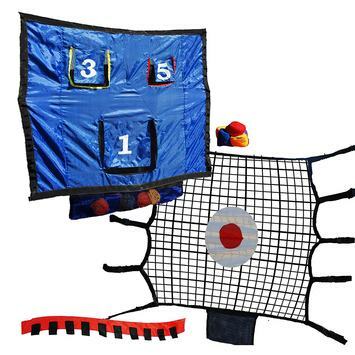 The kit comes with a total of nine bean bags and three different games the kids can test each other in. 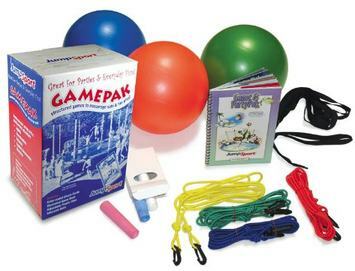 This one is similar to the toss game combo but, where that game encourages kids to play OFF of the trampoline, this kit incorporates the fun of jumping with over 20 possible games. We've thrown a couple of birthday parties at our house for our kids' friends and this has been a hit both times. There are so many games to choose from here, we haven't even come close to trying them all out. Ok, I'll be honest. This is my personal favorite. We've all seen kids camping out in the backyard on television, but I honestly had no idea it was something kids loved to do so much. 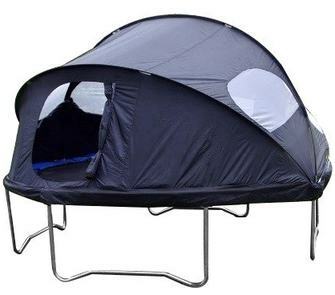 This little gem turns your trampoline into possibly the coolest tent your kids will ever sleep in. Since we bought this thing, my kids have slept out on the trampoline more times than I can count. As you might imagine, our place has become the most popular sleep-over destination in the neighborhood. I've even slept outside on the trampoline a few times myself because of this tent. (For the sake of preserving my mature image, we'll pretend the kids were there with me.) It's surprisingly comfortable and does a great job at keeping the bugs out while keeping warmth in. I don't know that I would let anybody sleep in it if the weather got too cold, but so far it's not bad for a cool spring night. Honestly, I had no idea how cliche' my kids could be until I started trying out some of these toys. I never imagined my children as those kids that would be dying to go outside and play in the sprinklers, mostly because we tried it with my oldest when she was two and she screamed like a banshee when the water hit her. 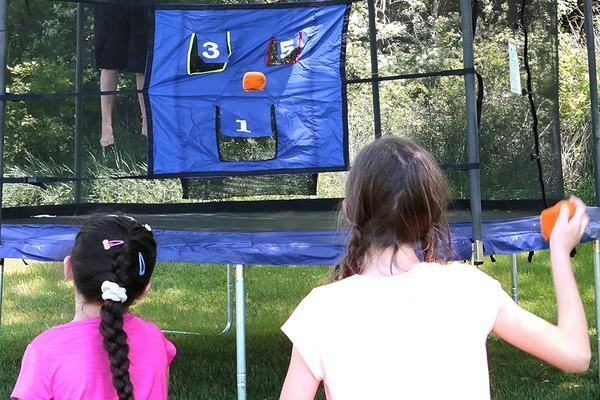 If the tent is my favorite, this is easily my kids' favorite trampoline toy. 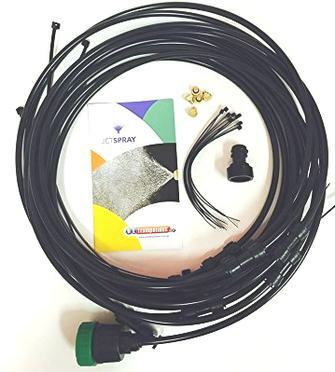 This is basically a hose kit that clamps around the top edge of your net enclosure and then connects to the water hose. Turn the water on and the trampoline is covered in a mist of water that rains down from above. Seriously, this is so simple but my kids just can't get enough of it, especially on warmer days. The water does tend to make the jumping surface a bit slippery, so I wouldn't let your kids use this without supervision and you definitely don't want them to get too crazy with their antics while using it, but it's a great option for kids to enjoy during the summer when they need to cool off a bit. For more night-time fun, this one is really pretty neat. Basically what you have here is an LED spinner that you set up under the jumping surface of the trampoline. Wait for the sun to go down, turn this thing on, and watch it turn your trampoline into a laser light show. It comes with four hooks that attach to springs on the trampoline to detect when somebody bounces. Every time a bounce is detected, the spinner lights up. 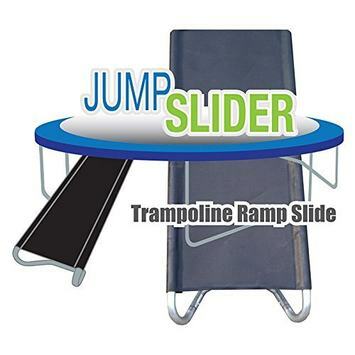 Not only is this cool and adds an exciting new element to the trampoline, but it also adds a bit of safety for jumping at night. The LED is situated in the middle of the trampoline and it naturally guides jumpers back to the center to keep them away from the edge. Something my kids have really enjoyed is combining this LED spinner with their trampoline tent. Note that your children should not jump on the trampoline while the tent is installed. 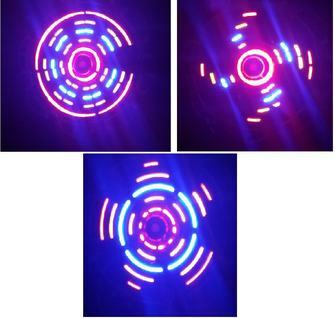 However, the LED spinner is just sensitive enough that when they move around inside the tent, the spinner will go off. Because they never really know when to expect this, it's sort of a fun "camping game" that they all seem to enjoy.